Whoa! What 2 weeks it’s been. I totally forgot to post last Monday. We are in full swing to get our house ready by April 1 to put it on the market so I have been scrambling every last minute to do stuff around the house. Since Hubby has hurt his back I did find a crew to hire to finish the basement. That starts on the 21st. Then I have a guy coming to lay living room carpet some time that week as well. Hope you all have a super week. I know packing boxes and painting has been my workout! Enjoy the recipe. PREHEAT oven to 375°F. Grease 13 x 9-inch baking dish. HEAT oil in large skillet over medium-high heat. Add zucchini and peppers; cook, stirring frequently, until soft, for about 8 minutes. Add garlic; cook for an additional 2 minutes. Season with 1/4 teaspoon each salt and pepper. Remove from heat. MEANWHILE, WHISK together flour, 1/4 cup evaporated milk and remaining 1/4 teaspoon each of salt and black pepper in medium saucepan until smooth. Whisk in remaining evaporated milk. Heat over medium heat, stirring frequently, until mixture comes to a boil. Reduce heat; simmer for 3 minutes or until thickened. Stir 2 cups of milk mixture into cooked vegetables; reserve remaining milk mixture. SPREAD 1/2 cup marinara sauce over bottom of the prepared baking dish. Top with 3 noodles. Top with half of the vegetable mixture. Top with 3 noodles. Spread 1 cup marinara sauce and sprinkle with 3/4 cup mozzarella cheese. Layer 3 noodles, remaining vegetables and remaining 3 noodles. Top with remaining marinara sauce, reserved milk mixture, remaining 3/4 cup mozzarella cheese and Parmesan cheese. BAKE for 35 to 40 minutes until golden and bubbly on the edges. Let stand for 10 minutes before serving. • For extra flavor, add a bay leaf to the white sauce while cooking. You always have such delicious looking food on your blog! Oh man, I started drooling from the second I saw that picture. That looks amazing! I’m bookmarking this for sure! 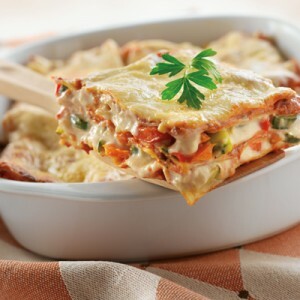 mmm that lasagna looks yummy as do all of your other recipe posts! Yum. That’s a beautiful lasagna. Have a great week.